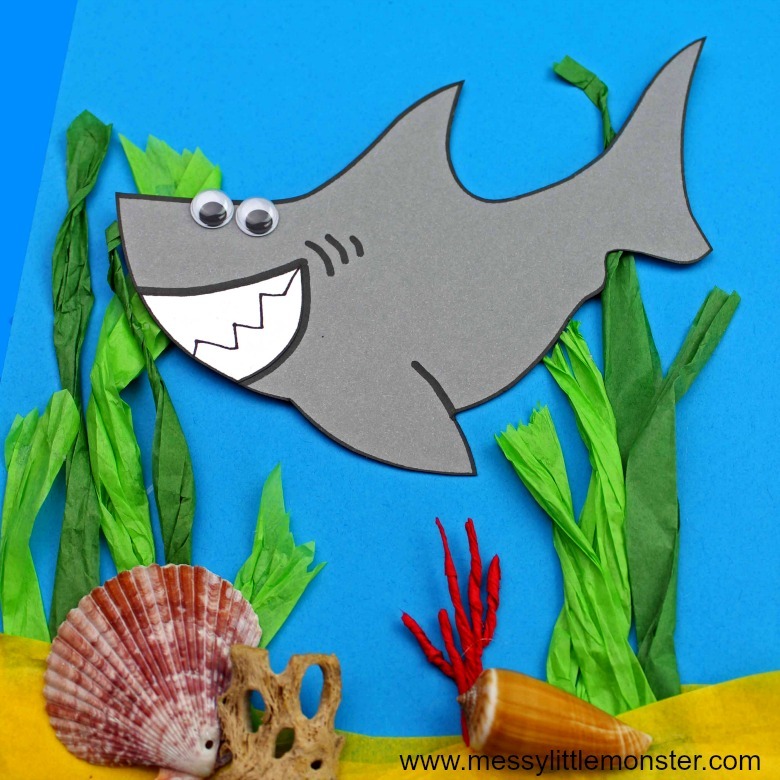 If you are planning on doing any ocean themed crafts and activities this summer then this easy shark craft for kids has to be added to your list! 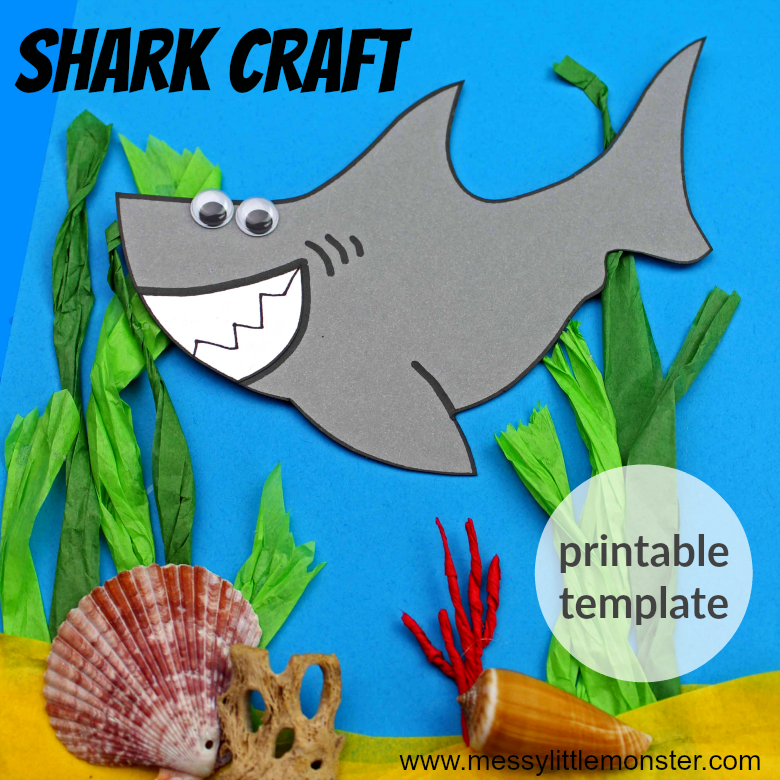 We have a free printable shark template to make it really easy to recreate your own shark craft. 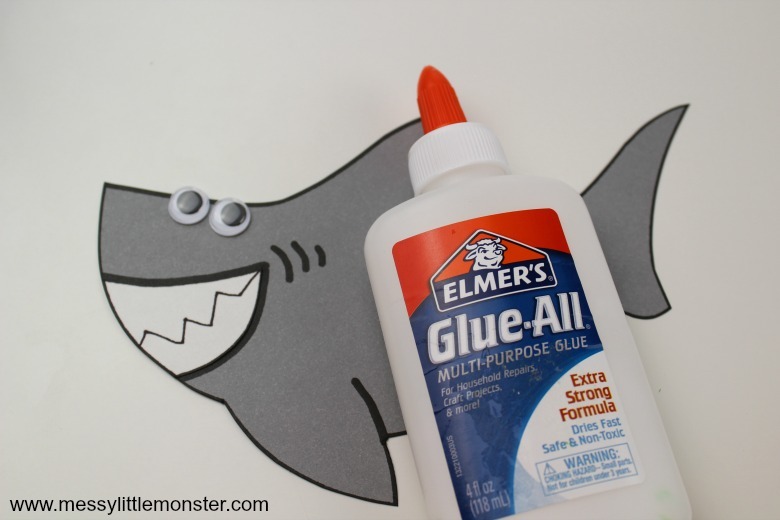 This is the perfect shark craft for preschoolers or toddlers to enjoy. 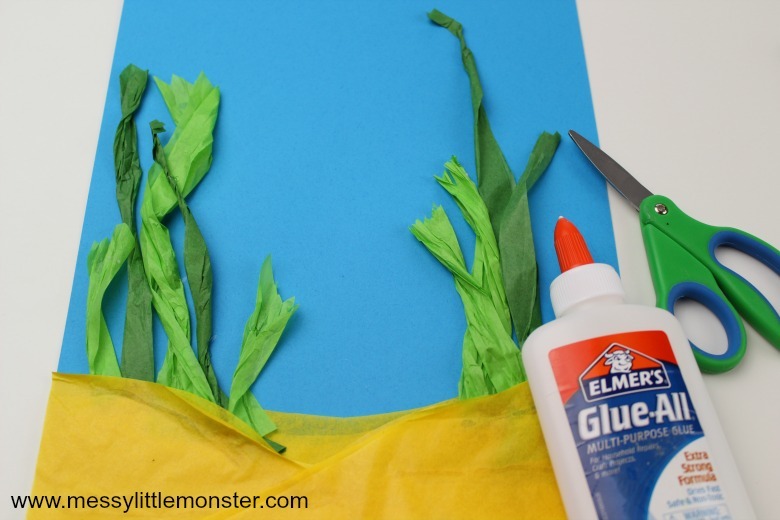 They will love glueing on weeds and real shells to create an ocean for their shark to swim in! 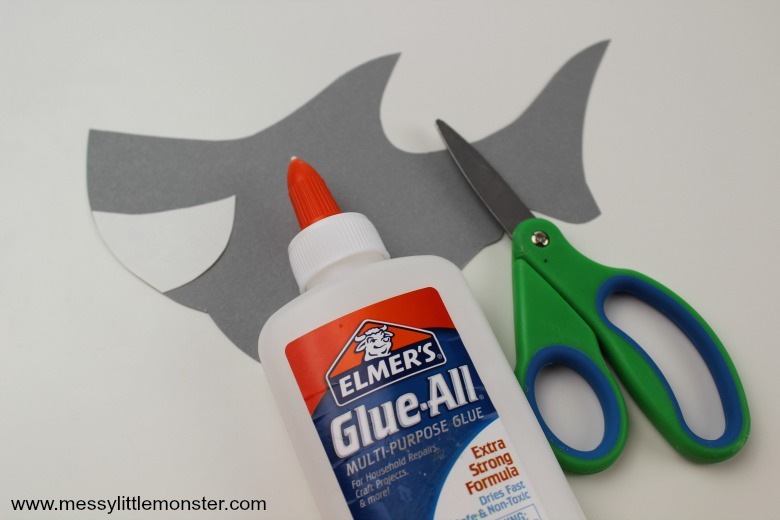 This shark craft is great for toddlers and preschoolers as we have a printable template for the shark, but the ocean can be created in any way they choose! We have lots of other ocean themed activities that young kids will love! You could try making some rock fish (and even a rock shark! ), play with ice fish or make a counting fishing game! We also have a set of under the sea colouring pages that are perfect for an ocean themed project. Before beginning your shark craft you will need to gather all your supplies. If you haven't already downloaded and printed out the shark template scroll down to the bottom of the page where you will find the shark printable. Cut out the shark template and trace around it onto grey cardstock. Light grey works really well. After you have traced your shark carefully cut it out. Toddlers and younger preschoolers may need help with this step. Cut a mouth from white cardstock and glue it onto the shark. Use a black marker to outline the shark and add detail. Glue googly eyes onto the shark. 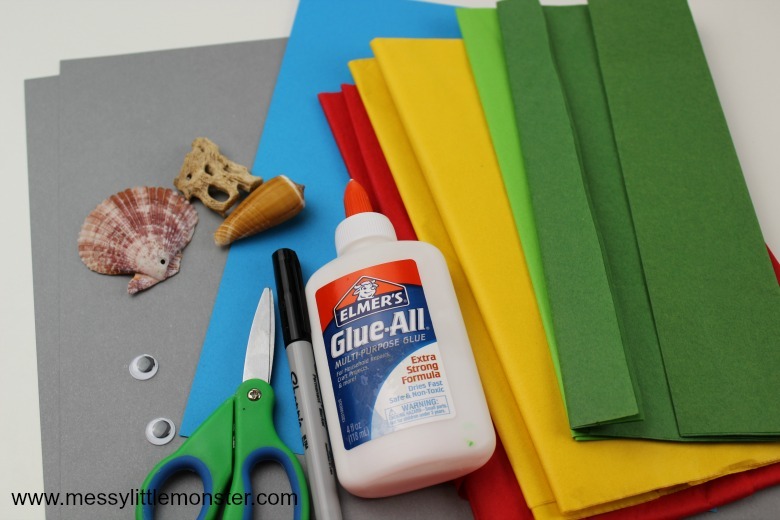 Kids can get really creative during this step of this easy shark craft, there is no right or wrong way to create the ocean! Use blue cardstock to create the water and then add seaweed, sand and shells. You might want to glue on yellow tissue paper to create a sandy bottom and then glue twisted green tissue paper behind the yellow tissue paper like in the images. Other suggestions are to use real sand or to draw or paint seaweed and sand. You could add a few other fish too! Once you are happy with your ocean it is time to glue on the shark. Play around with putting the shark in different places before glueing it in place. Once you have glued the shark in place you might want to draw on a few extra little details like bubbles or a fish in the sharks mouth! Your shark craft is complete! 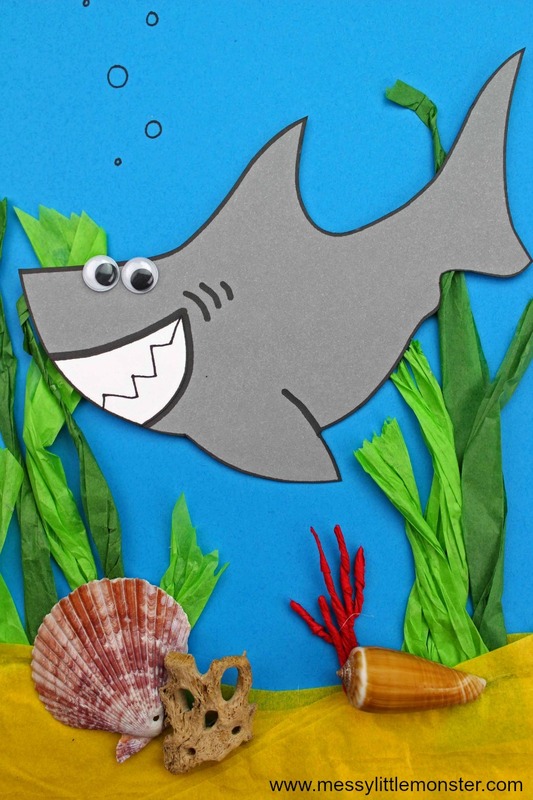 We hope that you had fun making this easy shark craft! It is such a fun ocean themed activity for kids as they can be really creative by adding all kinds of different things to their oceans. We have lots more ocean themed activities for preschoolers and toddlers. Try some fish themed frozen gloop sensory play, make some rock fish or print out some ocean colouring pages! To download this shark template for free add $0 and click on the 'I want this' box below. It may take a moment for the page to load so please be patient.